Unfortunately, Google translate has no idea what Jin Qian Wa means, so that will have to remain a mystery. What is for sure, however, is the fact that in yet another Chinese themed slot, Playtech have managed to create a stylish machine that although light on bonus features, is heavy on payments, and maximum wagers. Whilst this one certainly caters for the highest rollers, those will smaller bankrolls can size their bets down, and still enjoy this great machine. Great looking, stylish machine with a strong theme. It’s easy for these Chinese themed machines to feel samey after a while but fortunately, Playtech have been able to combine a solid traditional soundtrack, with stylish graphics in a package that feels fresh amongst a sea of similar ideas. Ideal for high rollers. There are few slots out there that let you wage £2,000 a spin. Obviously, this won’t apply to most players but is a great advantage if you’re inclined to bet big. Can feel a little samey. Those who like multiple variations of bonus rounds will find the action quickly feels repetitive, and there for will likely prefer playing other machines. The biggest jackpots in the main game are won from hitting five-of-a-kind of various symbols. These are, as you’d expect, inspired by Chinese folklore and superstition. There’s a golden frog “wild” symbol, a yin yang, and various creatures made from precious stones. The pay outs for hitting five of these across a win line are as follows. Golden Frog = 1000x the line bet. Yin Yang = 400x the line bet. Jade dragon, amber turtle, or pewter elephant = 250x the line bet. Being as the highest possible bet per line is a mighty £50, the maximum jackpot win during the main game is an impressive £50,000 – convert this to Yen, and you’re technically a millionaire! As mentioned, the Jin Qian Wa slot machine doesn’t offer a great deal in terms of bonus rounds. This is unfortunate as such features can really increase player enjoyment, and therefore the replay value of a slot machine. 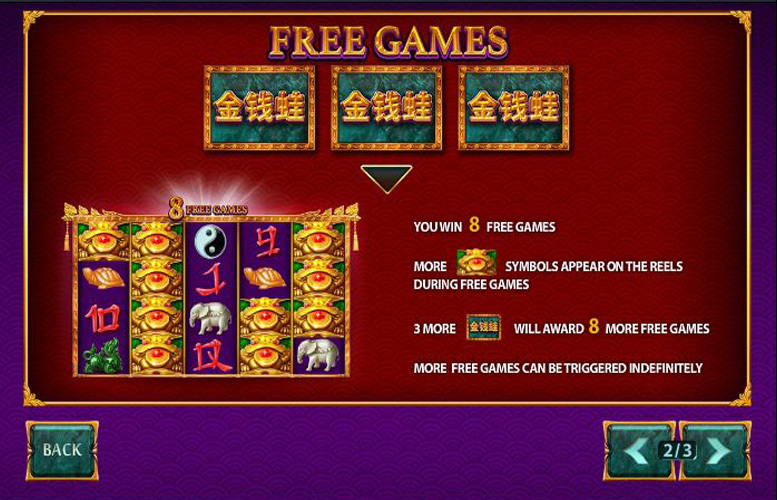 The free spin bonus round is triggered by landing the “scatter” symbol (Chinese text/game logo icon) on reels 2, 3, and 4 simultaneously. This awards the player eight free games. During these spins, additional “wilds” will appear across the reels, substantially increasing the chances of a big win. What’s more, if players are fortunate enough to land the “scatter” symbol on the required reels during these spins, they’ll receive an additional eight freebies. This is a dynamic that can repeat indefinitely too. 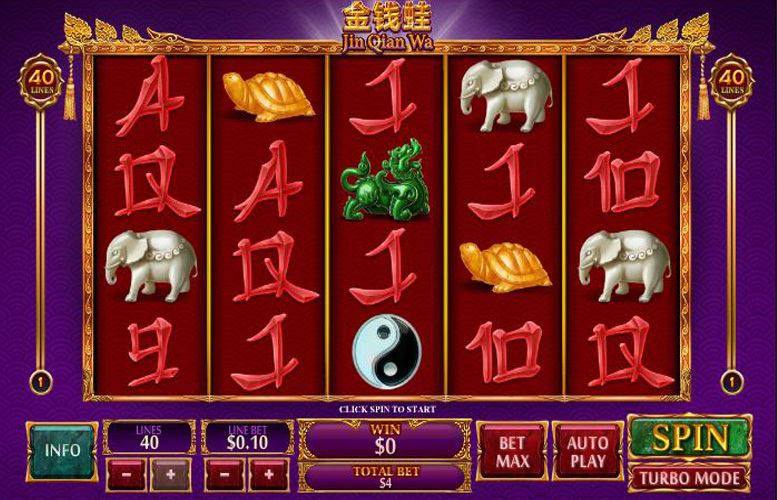 Another feature of the Jin Qian Wa slot machine is the Golden Frog stacked wilds. 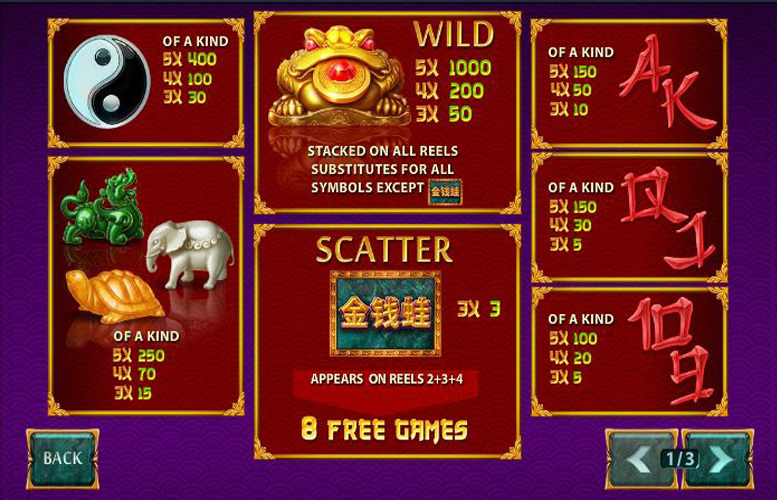 The huge rows of “wild” symbols (four stacked per symbol) can massively increase a player’s winnings in a very small amount of time. 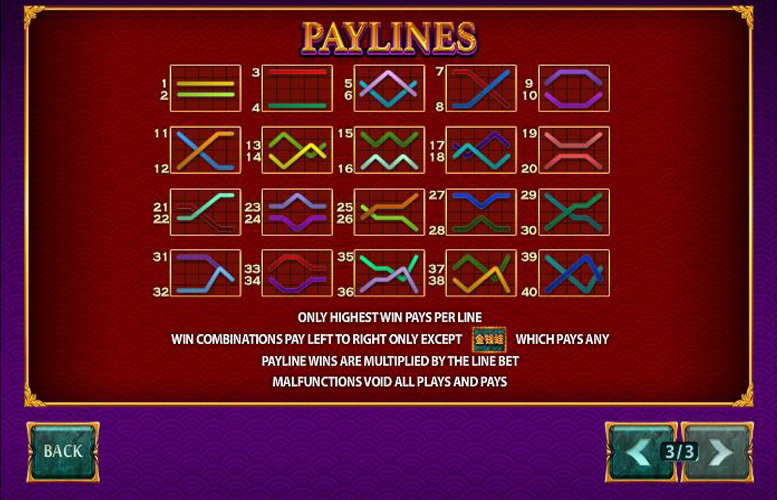 10, or 9 = 100x the line bet. As mentioned, Jin Qian Wa is a treat for the high rollers out there. With its maximum of 40 different win lines, and highest bet per line of £50, the largest possible wager per spin is an impressive £2,000. This needn’t put players with lesser bankrolls off, however, as they’re settings to scale the total bet right back to as low as a measly 1p. The machine caters for all pockets, not just the richest. Jin Qian Wa is quite a basic machine, which will certainly appeal to some. It’s got great style, fantastically chilled out music, and the inclusion of such high betting options is great for those with the most funds to gamble on it. Unfortunately, although the stacked wilds and free spins can be lucrative, when compared with some other titles out there, they don’t really come close to many of Playtech’s other creative design features. This will hinder the enjoyment some players are able to glean from this machine. This game has a rating of 4 / 5 with 390 total reviews by the users.